Based on the bestselling book, Collaborative Leadership: Six Influences That Matter Most, the workshops outline a five-day series of one-day seminars for both new and veteran leaders, as well as teacher leaders and instructional coaches who aspire to engage more of the staff they work with on a daily basis. Foundation Day for Collaborative Leadership helps set the foundation of what collaborative leadership looks like. Highlighting 6 of John Hattie’s high effect influences on learning, foundation day will explore the different stakeholders that leaders need to work with, and is meant to inspire participants to share best practices. The day begins with leaders establishing a goal, which Hattie’s research shows has an effect size of .51. Foundation day will also involve leaders participating in a mock observation and collaborative observation discussion so they can learn to ask the right questions and provide effective feedback. See a sample agenda. Collective efficacy is key to helping a school community go to the next level. It is the belief we have in our staff, and centers around a problem of practice that is focused on our current reality. 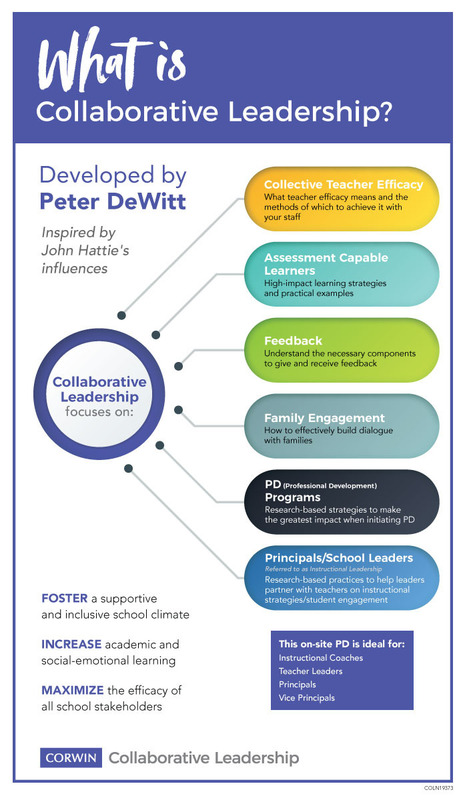 Now that participants have spent day one gaining an understanding of instructional leadership and self-efficacy, they are now well-positioned to create an environment where collective efficacy can take place. In this workshop, participants will learn the nuances of collective efficacy, as well as how to build it through authentic professional learning and development. Additionally, at the end of this session, participants will be required to do readings from the required text, and they will have to go back to school and collect evidence that helps them understand to the extent that they build collective efficacy. After participants take time to review questions around building collective efficacy, we move into exploring the levels of feedback needed in order to help teachers and staff grow, as well as the triggers that often accompany receiving feedback. Using the feedback model, participants will learn how this will help them have more impactful formal teacher observations that include teacher voice and authentic learning goals. We will also explore the levels of instructional feedback that students need. These discussions and activities will bring participants to the 5th influence, which is assessment-capable learning. Throughout the day participants will first learn about the social-emotional aspects of building assessment-capable learners, as well as the enabling conditions that all schools should have in order to engage all students. At the end of this session, participants will be required to collect evidence from their school to help them understand the quality of the feedback they provide to staff, or how to create an inclusive school climate for all students. Participants will learn about surface to deep level learning, as well as more of Hattie’s high effect influences that help students grow academically. Family engagement will be explored, specifically ways to increase dialogue and engagement from families. At the end of this session, participants will be required to do readings from the required text, and continue evidence collection in their own schools. During this hands-on workshop day, we will wrap up our sessions together by dividing the day into three sections. The first part of the day will be an evidence sharing session with two other participants. The second part of the day will be spent reviewing any information that the participants need a deeper sense of learning in, and the third part of the day will be team or individual time where participants will formulate a plan focusing on how to move forward.